Needs visiting NPCs and related quests. 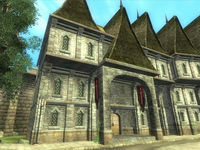 Skingrad Fighters Guild is in the north end of Skingrad, next to the Mages Guild and across from West Weald Inn. The local Fighters Guild members, Ah-Malz, Fadus Calidius, and Parwen, all have a particular disdain for goblins and speak at length about it. 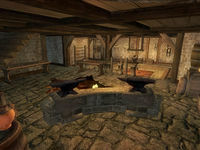 The building is divided into Skingrad Fighters Guild, Fighters Guild Upstairs, and Fighters Guild Basement. The front door of the building leads into a small entrance with a doorway on each side, and a set of stairs beyond them on each side. The doorway on the left reveals a dining room with a large round table that seats four. On the table are two bottles of cheap wine and a bottle of Tamika's West Weald Wine. The door opposite this room leads into another dining room, this one with a long table that seats twelve. The two barrels near the entrance contain clutter and/or repair hammers. The cupboard in the northeast corner contains food. A weapons rack in the northwest corner holds an iron warhammer and claymore. The display case next to it contains a dwarven ceremonial shield, which is partially outside the case due to bad placement. A garlic cluster hangs from the mantel next to the display case. In the west corner, next to the door to the Basement, a bookshelf holds an iron battle axe, shortsword, bow, and three iron daggers. A chest on top of the shelves contains clutter. Both sets of stairs in the main entrance lead up to one large room. One single bed is against the southwest wall, and the chest at the foot of it contains clutter, as does the cupboard next to it. Four more beds are against the southeast wall, along with three more clutter chests. Another bed is against the northeast wall, with yet another clutter chest and cupboard. A cupboard on the northwest wall also contains clutter. The stairs in this end of the room leads upstairs None of the containers here are safe for long-term storage since all respawn. To the right of the entrance to this level is an alcove with two clutter chests. The door opposite the entrance leads into a bedroom with a double bed on the southwest wall. The chest at the foot of the bed contains gold, and possibly jewelry and clutter. The cupboard beside the bed contains clothing, as does the chest of drawers next to it. The drawers on top of the chest contain clutter. The desk in the north corner contains clutter and possibly a common book. To the left of the door is a large entrance area. The door on the southeast wall leads into another bedroom with a double bed. The locked chest at the foot of the bed contains weapons and/or armor. The chest of drawers contains clothing. The weapons rack next to the door holds an iron shortsword and war axe. The door on the northeast wall of the entrance area reveals a study with a large desk. The three chests in the northwest alcove contain clutter and/or repair hammers. The small bookshelf here holds an iron dagger and a steel dagger. The two chests at the foot of each of the beds on this floor are safe for long-term storage, but every other container here respawns and so is not safe. The table at the foot of the stairs into the basement holds three iron longswords and five iron daggers. The alcove under the stairs holds a cupboard that contains clutter and three clutter sacks on the floor next to it. The table next to the steps to the lower level holds two iron warhammers, and the weapons rack next to it holds two iron shortswords. Two crates stacked against the south wall contain clutter and/or a repair hammer, as does the barrel next to the forge. A repair hammer sits on the stone near the bellows. Two more barrels are stacked next to a crate near the steps against the east wall, all of which contain clutter and/or repair hammers, and two clutter sacks sit on the floor next to them. A large practice dummy is tethered in the middle of the lower level. The two cupboards on the east and west walls next to the steps both contain clothing. The barrels in the northeast and northwest corners both contain clutter and/or repair hammers, and the two chests on the north wall both contain clutter. The sacks here are the only non-respawning containers; every other container is unsafe for long-term storage.